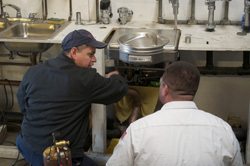 We have provided quality plumbing service to general contractors, franchise owners, property managers, commercial office buildings and warehouse facilities for 30 years in Southern California. We offer design build, new construction, tenant improvement, plan check submittal and ADA retrofits. Whether you are constructing a new building or upgrading an existing one, call us at 1 (800) 932–5327 to speak to Gerhard Kiessling, our commercial plumbing services coordinator. Hydrojetting was developed as a maintenance tool for the removal of grease and debris from sewer lines. Physically, Hydrojetting is the use of high pressure water (up to 4000psi) to remove grease and debris that have narrowed the diameter of the sewer line. A sewer line choked with the accumulation of grease and sludge can be restored to near original condition. Does Hydrojetting Control my costs? Yes, absolutely. The only way to control plumbing expenditures is to be proactive. Hydrojetting cleans a sewer line virtually eliminating a back up at the business volume peak. Please remember that once a sewer line has backed up, it is not just the cost of the hydrojetting. The true cost, and often more extensive is a loss of business and/or an establishment being shut down by regulatory agencies, such as the Health or Fire department. How often should Hydrojetting be performed? The frequency of Hydroetting is dictated by various factors depending on the type of establishment (restaurant, supermarket, factory, strip mall), the age of the establishment, the business volume of the establishment, and the size, pitch, and distance traveled by the sewer line to a common sewer truckline. Will Hydrojetting damage my sewer lines? Hydrojetting by itself does not damage sewer lines, but should only be conducted by certified technicians. Minuteman has its own in house training program as well as an outside training class for operation of a Hydrojetter. If a sewer line has lost its structural integrity a hydrojetter hose and nozzle can go outside the line.